San Francisco Examiner / San Jose Media Industry Examiner. By Del Daix. Published May 18 2009. 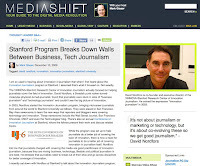 "The BBC should get rid of their broadcasting system to focus on content production only and leave the distribution open to new media vectors such as the web and mobile, said Vint Cerf, Google's vice president and chief Internet Evangelist, at the sixth conference on Innovation Journalism at Stanford University today. In today's "Attention Economy," making sense of the semantics is "a big white spot" in the macroeconomics information system, said David Nordfors, Executive Director of Stanford Research Center of Innovation Journalism." The European newsletter EurActiv published an interview on Innovation Journalism. The interview is here. (Also available as PDF here, in case the link does not work). 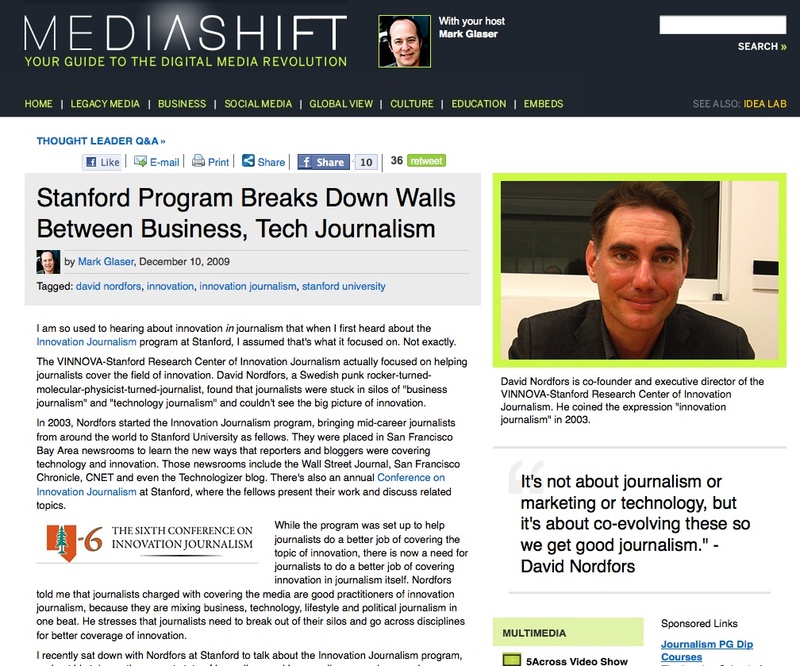 The leading Silicon Valley newsblog VentureBeat runs a story + audio interview with me on what innovation journalism is and what it is good for. Interview with me in Globes, the largest business daily in Israel, by Yael Gaoni on the topic of innovation journalism. The published version (in Hebrew) is here (online layout) and here (newspaper layout). The original unedited interview in English is here. 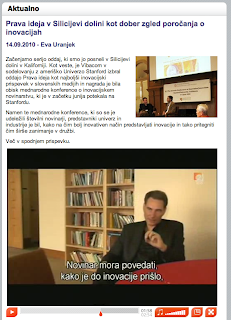 News story from the Slovenian E+ TV show covering the First European Innovation Journalism Workshop at the University of Ljubljana, Slovenia, EU. The reportage is made by Maja Nemec and is centered around interviews with David Nordfors. It was broadcast by Kanal A on 20 Oct 2006. 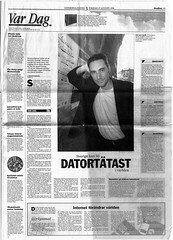 The Swedish magazine "Att:ention" published an interview with me on Innovation Journalism July 2006. The piece is written by Johan Jörgensen and Olle Corneer. Att:ention is a monthly magazine made by Veckans Affärer, published by Bonniers Publishing house. Veckans Affärer is the largest Swedish business weekly. A debate book in Swedish discussing how Sweden handles, and should handle, intellectual resources available to the Swedish society via immigration. One chapter in the book, titled "From labor immigration to brainpower immigration", is an interview with David Nordfors. 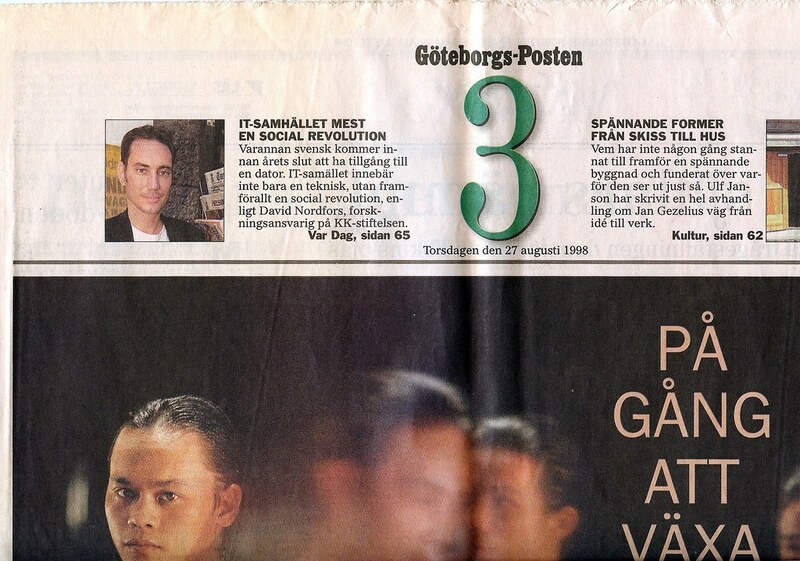 My study on incubators generated three motions to the Swedish parliament in 1999. They suggested support to a national Swedish incubator support system, referring to my study. The Riksdag should suggest the government to introduce a support mechanism for new high-tech companies according to the Israeli model. 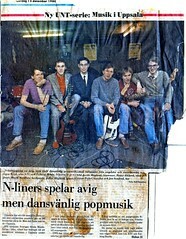 Dagens Industri October 2 1996. 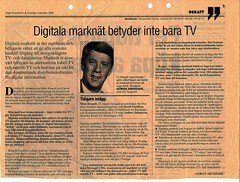 Göran Arvedahl, Executive Vice President of Teracom replies Brunell and Nordfors on Internet vs digital TV discussion. Brunell and Nordfors attacked in an earlier op-ed the Swedish government proposal for a national terrestrial digital TV network, claiming the government should put emphasis on developing Internet networking competence in Sweden, instead of building new TV networks on which it can control the content. Arvedahl, VP of Teracom, the government owned company that was designed to own the terestrial digital TV network, answers: Brunell and Nordfors have misunderstood. The digital TV network is what people need. Will also carry the Internet. 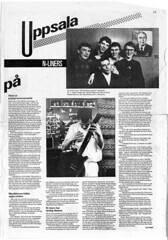 Interview with post-punk band N-Liners in Schlager, a Swedish rock music magazine. Published approx 1980.